Glitter & Gold is a very pretty tea. 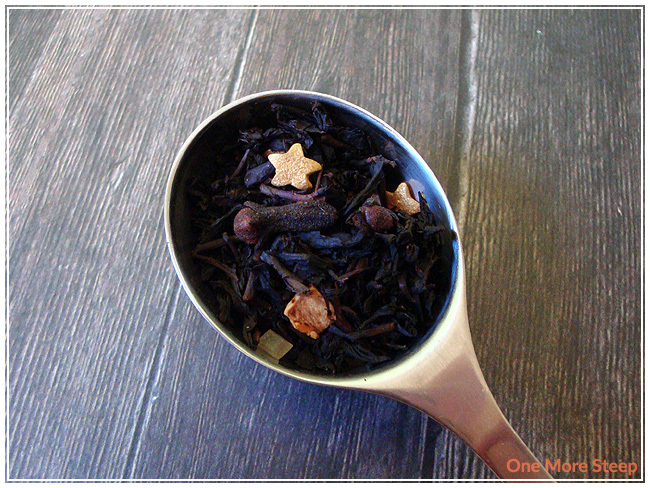 From the gold star sprinkles to the large sugar granules, it’s just a very pretty tea. When I first took a whiff of Glitter & Gold, I was intrigued. I can smell the cloves, it smells sweet, there’s an underlying scent of citrus that is almost like oranges, and the overall base of the scent is tea. All in all, it reminds me a bit when I’m baking a cake and adding in zest from some kind of citrus fruit. 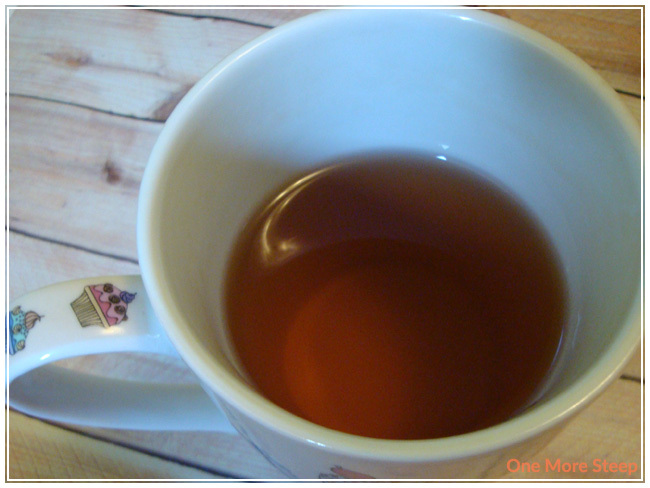 There are some vanilla tones to the fragrance, which makes the tea intriguing as a whole. The ingredients for this tea are: Chinese black tea, lemon peel, sugar sprinkles, sugar, cloves, natural & artificial flavouring. The tea definitely smells like its ingredients, aside from the vanilla (although that may be part of the natural & artificial flavouring, but vanilla is not mentioned on the website). 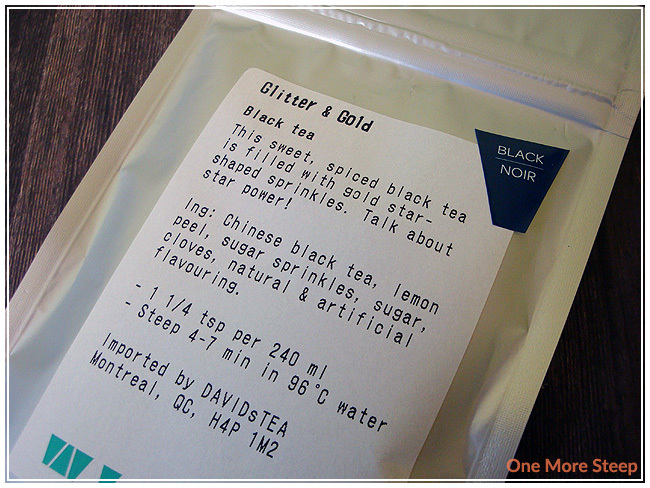 DavidsTea recommends steeping Glitter & Gold in 96°C (204°F) water for 4-7 minutes. The tea smells like cloves, lemons, and just an overall sweet aroma to the steeped tea. It’s a beautiful golden orange colour, like many black teas. The golden sprinkles didn’t fully dissolve in the 5-6 minutes that I steeped it for, I can still see remnants of golden star sprinkles in the tea filter I made up. The taste is quite pleasant. It has a bit of an oily mouthfeel to it, which I would attribute to the sprinkles (there’s oils in the sprinkles!) but it isn’t bad. The tea is smooth, it has a great light lemon flavour to it and the cloves just add a nice punch of flavour to the tea itself. Because of the sugar and the sprinkles, Glitter & Gold is a sweet tea but it isn’t overly sweet – I would not put it in the same category as dessert teas. Glitter & Gold actually reminds me a lot of Pumpkin Chai, it has a similar flavour profile just less the pumpkin and add in the lemon. Delicious! Glitter & Gold did alright with the second steeping, which I did for about 7 minutes. It’s still got a sweetness to it with the light lemon flavour coupled with the cloves. I quite enjoyed it, but it isn’t as fragrant as the first cup. I loved DavidsTea’s Glitter & Gold. It’s a very pleasant tea with a great aroma. The lemon isn’t overpowering, but still present, and the cloves just add a great flavour to the tea itself. I think with the ingredients, this tea makes a great autumn/winter tea because it’s just reminiscent of the traditional smells of the season. Plus it’s just very pretty and it makes a delicious cup of tea!